gathering with coffee, biscuits and lots of chat. Shroton is the southernmost village in the Benefice along the A350 towards Blandford. It nestles under the Iron Age Hill Fort of Hambledon Hill, recently acquired by the National Trust. There are about 150 dwellings and 350 people. The parish also encompasses the hamlets of Iwerne Steepleton to the south and Farrington and Shroton Lines to the west. 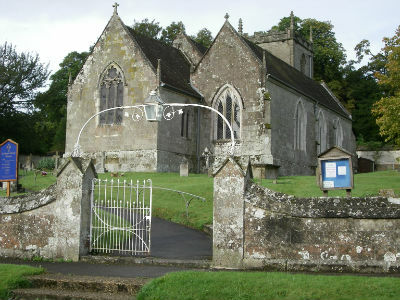 Shroton Church was substantially rebuilt on Norman footings in 1610. It was remodelled by the Victorians and reordered in 2011. It has a large memorial to Sir Thomas Freke with interesting heraldic motifs that are said to be the origin of the American ‘Stars and Stripes’ flag. The stained glass windows are of a high quality for a village church. The recent reordering consisted of removing all the poor quality pine pews and flooring and replacing them with a Purbeck Stone floor with heating underneath. New movable and stackable pews were purchased. A ‘servery’ containing a sink, an electric hob, cupboards and a coffee maker was installed. This is made in hand finished oak with a drop down lid that effectively conceals the ‘kitchen elements’. The Vestry was reconfigured to include a toilet with full disabled access, baby changing facilities and first aid. A large drop down projector screen has been fitted behind the arch between the Chancel and the Nave. We have a simple microphone system with a Loop for those with hearing aids. We also have more sophisticated amplification equipment that can be assembled for more modern music. The acoustics in the church with the stone floor and Barrel Vault ceiling are superb, which means the church is a good venue for concerts. Having removed the pews from the North Aisle, a clear space has been created. Most of the time this is used as a Children’s area with a carpet, toy box and small tables and chairs. There is also a Bechstein grand piano. However because of the flexibility now gained by moveable furnishings, we often use this area for concerts, a music group, a craft area or an exhibition space. These changes have enabled us to offer different styles of services. We always offer filter coffee, tea or juice and biscuits after a 10am service. We now hold a Breakfast @ 9 Service every other month. We serve hot bacon rolls, croissants, buns, toast, hardboiled eggs and a range of hot drinks and juice. This is followed by an interactive time of worship with songs, prayers and a Bible story suitable for all ages. We have served a ploughman’s Lunch, a tea party, drinks and cake after a baptism, mulled wine and mince pies after the Carol Service. We have 2 lay pastoral assistants in the village. Some visit and support the sick, the housebound and the elderly. Some are trained to take Holy Communion to people in their homes. Some are involved in children’s activities. Requests for visits can be made through the Church Office, which is situated in Shroton Village Hall. We have a very talented regular organist who also plays the piano to accompany guitarists for more modern music at some services. We welcome visitors to the Church. It is open during daylight hours every day. There is a chapel set aside for prayer and you will find helpful aids to prayer and a Prayer request book. Any requests are prayed for on a Friday morning.